President Donald Trump sought to unite a deeply divided nation with his call for a “new American moment” during his State of the Union address Tuesday night. The president used the speech to talk about his biggest legislative victory, tax reform and reduction, and the healthy American economy. Trump offered a deal on possible citizenship for “Dreamers” in exchange for compromises on other immigration issues. He said a path to citizenship could be given to hundreds of thousands of people who entered the U.S. illegally as children. In return, he said, lawmakers must support the building of a wall along the United States border with Mexico. He also said America’s visa lottery program must end. Trump asked lawmakers from both parties to join forces to rebuild the nation’s infrastructure and reset immigration policies. “I am extending an open hand to work with members of both parties, Democrats and Republicans, to protect our citizens, of every background, color, and creed,” Trump said. However, partisanship has only deepened in the year since Trump took office. The president, a Republican, has continued to make personal attacks against his political opponents. Democrats have continued to criticize Trump’s policies and behavior. In the hours before the president's speech, Republican lawmaker Paul Gosar called for the arrest and deportation of any, in his words, “illegal aliens” who attempt to attend the event. Democratic lawmakers had invited several “Dreamers” to attend as their guests. The future of the Dreamers led to a three-day shutdown of the U.S. government last week. Declaring “the era of economic surrender” over, Trump said he would fix bad trade deals and negotiate new ones. First lady Melania Trump listened from the gallery with several guests whose stories were noted by the president. 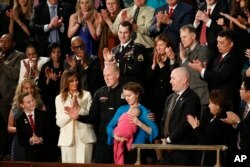 Among the guests were police officer Ryan Holets who adopted the baby of opioid-addicted parents. Other guests included Army Staff Sergeant Justin Peck, honored for saving a fellow soldier in Iraq, and Ji Seong-ho, a North Korean defector who walked with injured legs across China and Southeast Asia to seek freedom. Representative Joe Kennedy of Massachusetts provided the Democratic response to this year’s State of the Union. The grandson of political icon Robert Kennedy presented his party as the real champion of the middle class. In a break with tradition, the Democrats added a second State of the Union response. Newly elected Elizabeth Guzman a member of the House of Delegates in the state of Virginia spoke in Spanish. Hai Do wrote this story for VOA Learning English. Caty Weaver was the editor.